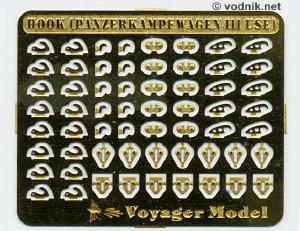 Lifting hooks set for WW2 German Panzerkampfwagen III was a second 1/35 scale release by Voyager Models company from China. Set number PEA 35002 is packed in a plastic bag with two small identical photoetched frets and instruction sheet inside. Instructions only tell how to assemble three types of hooks included in the set, but do not show the placement of them on the Pz. Kpfw. III model. This means that you have to use reference photos to make sure you attach them in correct positions. I'm not familiar with WW2 German armor models, so I can't be sure of it, but it is possible that at least in some plastic Pz. Kpfw. III models lifting hooks are provided as plastic parts and in such case replacing them one-for-one with metal parts should be easy. 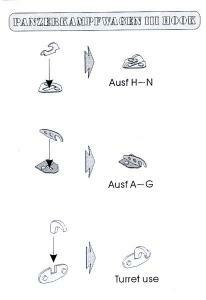 Instruction sheet shows how to assemble hooks. Click on picture to enlarge it. One of two identical PE frets included in the set. Photoetched parts are provided on two identical brass frets, 34mm x 42mm each. The brass fret is a bit thicker then usual at 0.25mm (0.01"). This is a real plus, as usual 0.15mm brass would be to thin to use in this case and each hook would have to be folded from too layers to get accurate results. Three types of lifting hooks are provided in the set. One type is for turret use and you get 10 of those on each fret (20 in total, with small base plate for each of them). The other two types are for hull: one type for Ausf. 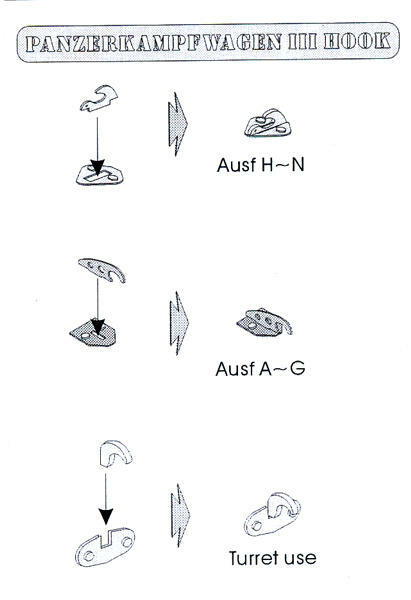 A to G variants of the tank and the other for Ausf. H to N variants. On two frets you get 20 hooks of the former type (with 14 base plates for them) and 32 hooks of the latter (again with just 14 base plates, but I know that those hooks can also be used for other types of WW2 German tanks and on some of them hooks are welded directly to armor, without those small base plates). I don't know exactly how many hooks are needed for a single Pz.Kpfw.III model, but I think that this set contains enough parts for at least 4 or 5 tanks! 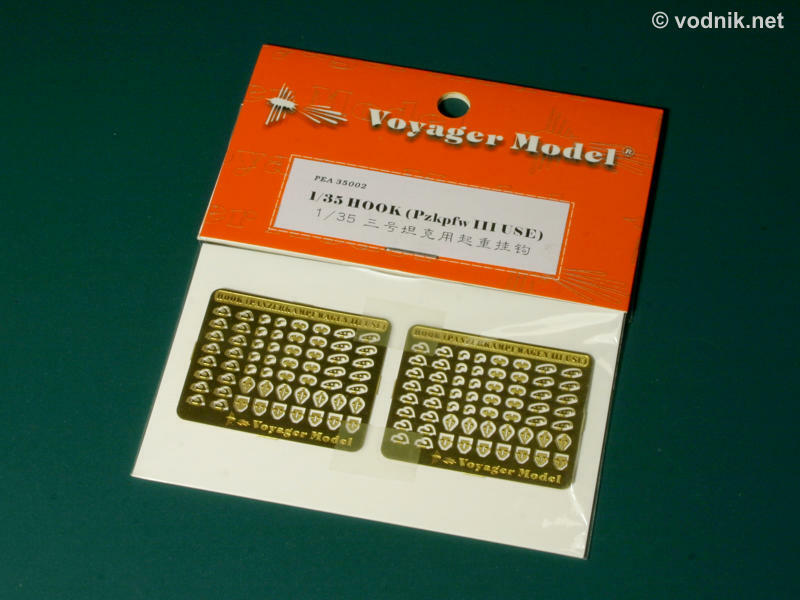 Brass hooks and base plates for them are very small (particularly those for the turret) - but no bending is needed at all and assembly is also quite easy, so most modelers should manage to add these parts to their models without any problems. The Voyager set will cost you about $10, and I think it is worth the price, particularly if you plan to build several Pz.Kpfw.III kits in various versions, as this one set will give you enough lifting hooks for a few models. As I mentioned earlier I'm not familiar with German WW2 armor models and aftermarket parts for them, so I can't say whether this set is not redundant with larger PE detail sets, which could also contain similar parts. But even if they are, you may choose not to use full PE set and still add those little hooks to your model to make it look better.